Making a money from the stock market is not an easy job. You need to do a lot of research in order to identify the best stock for the investment. If you have knowledge, capability and time of doing research to identify the best stock you should do that. But if you don’t have the inclination to do hard work for identifying the best stocks, you should follow Value Picker Stock Market Experts. Rakesh Jhunjhunwala, Dolly Khanna, and Porinju Veliyath are considered as India’s Top Investors. These Top Stock market investors inspire us with their knowledge and investment strategies. They are masters in identifying multibagger stocks for investment. Almost every stock identified by these stock market experts have generated a very good return over the long run. Thus, it makes sense to follow these value picker stock market experts. 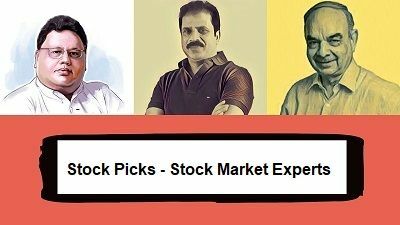 If you have decided to follow these stock market experts and looking for Latest Stock Pick from them, here are 7 Latest Stocks of stock market mavens such as Rakesh Jhunjhunwala, Dolly Khanna, and Porinju. Rakesh Jhunjhunwala is 53rd Richest Man in India. He is a veteran stock market investor and value picker. He has generated a massive wealth of 3.1 Billion Dollar from the stock market. He is also known as Warren Buffett of India. He manages his own portfolio as a partner in Investment firm Rare Enterprise. You can get more information about Rakesh Jhunjhunwala here. Jhunjhunwala is a long-term investor. He advises to select good stock and stay invested in the stock for long term. This strategy paid well, as stock like Titan contributed a lot in generating wealth for him. Rakesh Jhunjhunwala is a value picker. He believes in value-oriented companies. He does a lot of research and fundamental analysis to identify stock with a lower valuation, good growth potential, and competitive edge. With uncommon intelligence and skill Jhunjhunwala is able to identify and invest in stocks which have given multibagger returns to him. Few multibagger stocks from his portfolio for 2017-18 are Titan, Escorts, DHFL, Federal Bank and Delta Corp. Looking at magnificent returns it is worth to look and invest in the stock where RJ is investing. You can get this information from the shareholding pattern declared by the companies. As per data available at BSE website, Rakesh Jhunjhunwala has trimmed his stake marginally in seven companies such as Agro Tech Foods, Edelweiss Financial Services, Geojit Financial Services, NCC, Prakash Industries, Prozone and The Federal Bank. He has added 0.1% additional shares of Titan in his portfolio. New entries in RJ’s portfolio last quarter is DB reality, Jai Prakash Associates and Rallis India limited. Out of which Jai Prakash Associate is heavily debt company. Dolly Khanna aka Rajiv Khanna is Chennai based popular stock market investor. More than 80% stock holding of this couple has generated Multibagger returns. They mostly invest money in midcap and small-cap stocks. Rajiv Khanna and Dolly Khanna started a stock market investment with a capital of 1 Cr in 1996 and with skills of identifying and investing in multibagger, this couple has generated a wealth of 750 Cr from stock market by now. You can get more information about Dolly Khanna here. One thing which is evident from Dolly Khana and Rajiv Khanna portfolio is they invest only in small cap and mid cap stocks which have potential to grow big. This strategy has actually worked and they are able to generate a lot of wealth from the stock market. This couple plays the cards based on stock market condition. They deal in momentum stock based on technical and also deal with value stock and growth stock based on fundamentals. So, learning is you need both technical and fundamental analysis in order to generate wealth from the stock market. 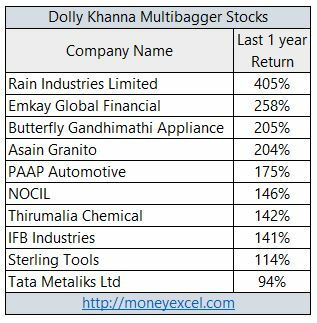 10 Mid Cap Multibagger stocks from Dolly Khanna Portfolio in 2017-18 are Rain Industries, Emkay Global, Butterfly Gandhimathi, Asian Granito, PPAP Automotive, Nocil, Thirumalai Chemicals, IFB Industries, Sterling Tools, and Tata Metaliks. Out of these Rain Industries has given 405% return to the investor. Emkay Global, Butterfly Gandhimathi and Asian Granito have given more than 200% return to the investors. As per latest shareholding pattern available at BSE website this couple has reduced their stakes in Dwarikesh Sugar, Gujarat Narmada, Nitin Spinners, NOCIL, RSWM, Ruchira Papers, Sterling Tools, PPAP Automotive and Thirumalai Chemicals. This time this couple has tried different sector associated with distilleries. All three new stock picks by this couple is from distilleries sector. These stocks are Associated Alcohols & Breweries, Radico Khaitan, and Som Distilleries and Beverages. All these stocks have generated stellar returns in the last one year. Porinju Veliyath is a most successful stock market investor in India. He has made his own fortune in the Indian stock market. The success story of Porinju Veliyath is quite interesting. From a homeless person, he has become one of the most respected value stock pickers of India. You can get more information about Porinju Veliyath from here. Multibagger stocks from Porinju Veliyath stock portfolio for 2017-18 are V2 Retail and Emkey Global. V2 Retail has delivered 141% return and Emkey Global has generated 116% return for the investors. As per latest information available Porinju Veliyath has recently purchased infrastructure stock Va Tech Wabag. As per Porinju, this stock is likely to get benefited from infrastructure growth story of India.